Do you have a flair for music? It plays a popular role in the life of cadets and playing as part of your squadron band is highly rewarding - competition for places is usually strong. Our aims are to introduce you to music within the cadets, provide you with musical instruction and the opportunity to play in our bands. Getting involved in music is a great way of socialising and of promoting the ACO wherever you play to the public. If you show real talent you could take your playing to the next level in wing or regional bands or even the National Marching Band which is being formed over the next year. Ultimately, you could join the National Concert Band - where our best players perform at public events often at some very prestigious locations, including Buckingham Palace! Every year Music Camps are arranged at all levels of the organisation. The first Air Cadet National Concert Band camp of the year usually takes place during the school half-term holiday in February. 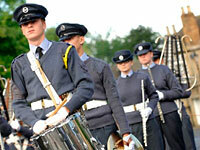 The Camp is arranged by Air Cadets HQ and takes the form of a week’s work experience with one of the two professional RAF Bands based at RAF Cranwell in Lincolnshire: the Band of the RAF College or the Band of the RAF Regiment. Sharing a stage with the best musicians in the RAF is a priceless experience! Throughout the remainder of each year further Concert Band camps take place, normally linked to a specific event. In addition, Marching Band camps take place (again linked to specific events) where our best musicians are given the opportunity of demonstrating their skills to the public. The musical year culminates with a competition to find the best solo performers, ensembles and marching bands in the organisation. Competition is fierce for those wanting to prove that they are the best! You can also do a BTEC in Music and turn your fun and talent into a formal qualification. Taking to the stage and representing your squadron, or playing at parades, is a vital part of the cadet experience, and if you've never played an instrument before, this is your chance to chalk up another skill that air cadets can help you discover and make the most of.